generals ka peshab nikal jata hai... golden statement? taliban ko train ISI ne kiya... was ok? sb kutton ko pala hi army ne hai... was brilliant quote? so rizvi should've raised his speech level to extent where our PM reached years ago. he must be punished. take lessons from PM. Bakwas aadmi ki abb koi wuqat nahi bachi.. iss ki khabrain bhi chaana bekaar hai.. itna ruswa hua hai yeh bhi..
After so much time they are still in the remand stage. One day they will be released quieten and 'Allah Allah khairs Allah', story will end. Hearing Per Gaye Thai Aap ?? Phansi lagain is fitnay ko. Well done..keep him inside jail.. I think so too. This Khadim Rizvi bechara is a simple man, he didn't really understand politics and how to survive in this country. The language Nawaz n Maryam have used against judiciary and establishment and it is okay for them because they are in bed with establishment. Poor Khadim, he thought there is freedom of expression in this country. But the thing that led to his demise was insulting Imran Khan and Imran Khan can't take criticism. It was very easy to fix Khadim in jail. He's history now. He's probably being brainwashed by ISI dogs and establishment. Reminds me of a person in my village. He was abducted by army and released years later and everyone said he has completely changed, he doesn't even seem like how he was. The guy was so scared of army then and had nothing but praises for army lol. 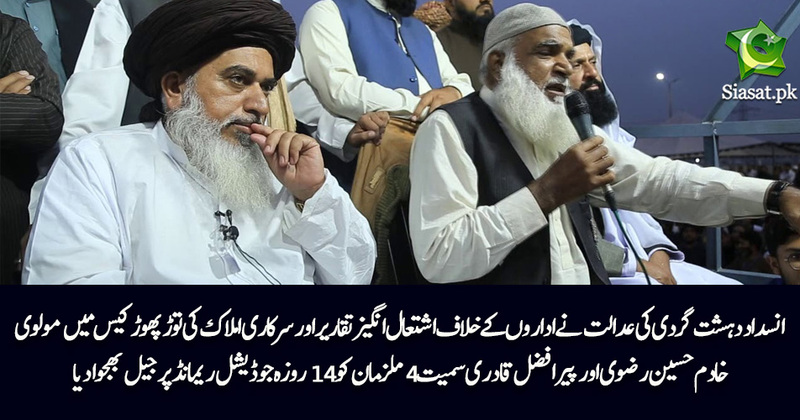 In a few months or maybe years, Khadim Rizvi would be released and he would've become an army boot polisher. Thats so Cutee ... Awwwww. Ok its sleep time, go change your diaper and go to sleep.